On January 10, 1956 Elvis Presley made his first recordings for RCA Records in Nashville, Tennessee. That July, RCA released Don’t Be Cruel, the first song that Elvis’ publishers, Hill and Range brought to him to record, and about six weeks later, Go Boy’s Shadow was crowned the World Grand Champion Tennessee Walking Horse at the National Celebration in Shelbyville, just an hour south of the Grand Old Opry. 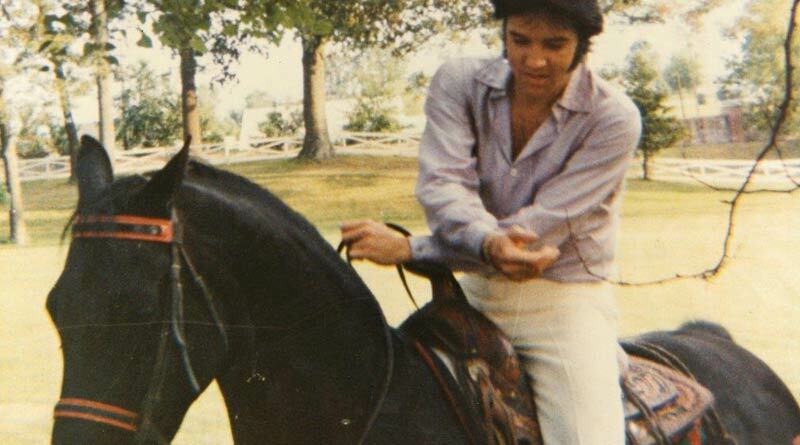 Elvis loved music and he loved the Tennessee Walking Horse. During the time we lived at Graceland in Memphis, Elvis often enjoyed riding our Tennessee Walking Horses down to the gates to show them off to his fans – and walkers still reside at Graceland to this day. He loved the breed so much that in 1983 our family presented a one-time trophy at The Celebration in his honor. Thirty years later, we were made aware that The Celebration had continued presenting the trophy each year, and we contacted them to ask for use of trophy to end and it be returned to Graceland. Unbeknownst to the Presley family, the show chose to use the Elvis Presley name for 30 years to add legitimacy to an event which is based on animal cruelty perpetuated by a painful practice called soring. Soring is the intentional infliction of pain to horses’ front limbs by applying caustic chemicals such as diesel fuel, kerosene, and mustard oil or inserting sharp metal objects into the horses’ hooves to achieve and artificial man-made gait known as the “big lick.” It’s widely known that when Go Boy’s Shadow won the championship in 1956 he performed his natural gait, but when he came back to win again in 1957 with ankle weights and stacked shoes on his feet he performed a much higher step and fancier gait than he did before – and while Elvis began lighting the nation on fire with Don’t Be Cruel, soring began lighting Tennessee Walking Horses’ feet on fire for the first time, and the practice grew rampant. Elvis Presley and his favourite horse, Rising Sun. © Elvis Presley Enterprises, Inc / © EPE, Reg. US Pat & TM Off. Not long after I asked for the trophy to be returned, I became very active in the movement to end soring, and to pass the Prevent All Soring Tactics (PAST) Act, a measure that would amend Horse Protection Act (HPA) of 1970. PAST would amend the HPA to eliminate the use of the large stacked shoes and ankle chains that are integral to the soring process, replace the industry’s failed self-policing system with licensed USDA inspectors at no cost to the taxpayer, and increase penalties for abusers who violate the law. I’ve advocated for the passage of the PAST Act and made countless appeals to the House Republican Leader Kevin McCarthy to bring the PAST Act for a vote, but he never did, because of a handful of federal legislators from Tennessee and Kentucky, whose campaign coffers have been filled with cash from violators of the HPA that have blocked the measure at every turn. In 2016 I advocated for the enactment of a USDA regulation that would have removed the heavy stacked shoes and ankle chains, and that regulation was finalized by former Secretary of Agriculture, Tom Vilsack, but it failed to be recorded in the Federal Register, and was later rolled back by the Trump Administration, leaving the horses more vulnerable to abuse than ever. Since that time, the USDA has allowed soring to run rampant, and has even removed a searchable database that allowed the public to determine which trainers and owners were routinely violating the law – keeping the public in the dark and allowing abusers to return to the shadows. But there is hope – with House Speaker Nancy Pelosi (D-CA), and Majority Leader Steny Hoyer (D-MD) now leading the U.S. House, the PAST Act has a chance to become law. I traveled to our nation’s capital in January to meet with both Pelosi and Hoyer and conveyed the importance of this issue to the American people, and the voiceless thousands of horses we all care so deeply about. We have a plan to finally bring the PAST Act, reintroduced as H.R. 693, the “U.S. Senator Joseph D. Tydings Memorial PAST Act” by bipartisan Reps. Kurt Schrader (D-OR), Ted Yoho (R-FL), Steve Cohen (D-TN), Ron Estes (R-KS), Jan Schakowsky (D-IL), and Chris Collins (R-NY), named in honor of the author of the 1970 law, who passed away last Fall, to a vote. The bill has garnered 177 cosponsors in the House, but we need more, and we need the public’s help to show Nancy Pelosi and Steny Hoyer that the majority of Members still support the bill that garnered 290 cosponsors in the previous Congress, and I know we can reach our goal. By calling 202-224-3121 or clicking here to ask your Members of Congress to cosponsor H.R. 693 you can and will make the difference. Priscilla Presley is an actress, producer, and animal wellness advocate in Beverly Hills, California. How can I support the proposed legislation to ban soring if I am in NZ and not a US citizen? Gwynneth, I am in NZ and also wish I could help. Sadly there is nothing we can do to influence US legislature, but we can tell horse lovers around the world what is going over there and throw the spotlight onto this abuse. It is truly barbaric how these horses are treated. It is incredible that in this day and age we still allow such practices to carry on. Please offer your total support to those who can get this bill passed without delay. Those who continue to use these methods should receive the maximum penalty available.